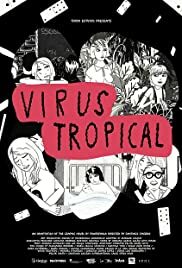 This full length animated feature is inspired by the graphic novel by the Colombian-Ecuadorian illustrator Power Paola, and directed by Santiago Caicedo, TROPICAL VIRUS is so called because when Paolita’s (as Paola is called) mother had her in her womb, the doctors told the mother that she was not pregnant and had contacted a tropical virus. She conceived anyway going birth to Paolita, the youngest of three sisters. The film a shows us the life of the Gaviria family, seen from the perspective of her, from her unexpected birth to the inevitable journey to reside in another country. Paolitia faces a series of events that will change her perception of the world that surrounds her. Caidedo’s film is high spirited, full of keen observations, totally femminist and totally delightful an refreshing. It is a coming-of-age stay set in a foreign place (Ecuador and Colombia) though the problems encountered by the young protagonist is common to all. The animation is simple but stylist offering a different look in an animated film.